The Avatar electric bike is a robust model. It can handle the rugged terrain or work as a nippy city bike. It comes in step over and step through models, so it’s perfect for men and women. With the battery cleverly hidden within the frame, no-one will ever know you are riding an electric bike. 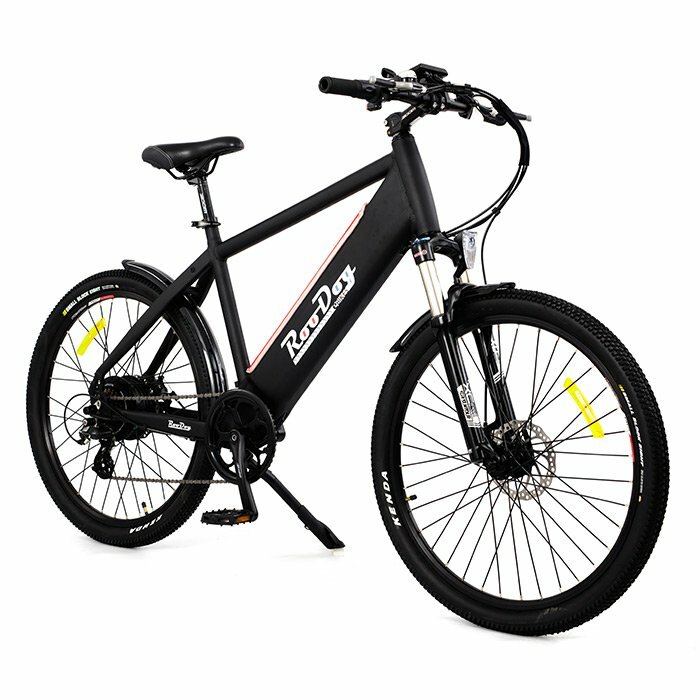 With powerful LED lights and 30 plus miles range, this ebike will help get you home no matter where you may wander. Made from lightweight aluminium alloy, the Avatar is super easy to ride, even before engaging the motor. The RooDog Avatar electric bike is a dual purpose bike. 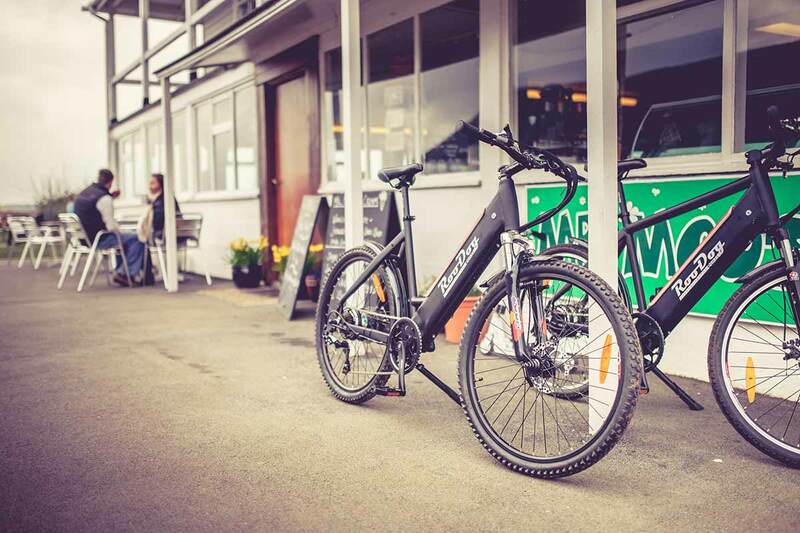 It can be a nippy city e-bike or a mountain e-bike whatever you like! It purely depends on how you dress and what you feel like riding this RooDog. The Avatar electric bike has a built in removable battery in the frame for a sleek look and added security. We have also done a few little upgrades new for 2018. The Avatar electric bike now comes with an LCD display as standard along with Suntour XCR32 lock out fork suspension. A 36V 10Ah standard size lithium-ion battery. (Now with maximum speed of 15.5mph which is allowed by UK/EU regulation). LCD display has battery indicator and management of 5 speed PAS and LED lights system, tripometer and speed indicator. Avatar Step Over 20 inch frame made of light weight aluminium alloy 6061 making it a super smooth comfy ride with or with out power. Avatar Step Through 18 inch frame made of light weight aluminium alloy 6061 making it a super smooth comfy ride with or with out power. The choice is yours. We would recommend that the Avatar would suit a rider from 5’6ft to 6’3ft tall. The Avatar will do 30 plus miles per full charge on level 5 (highest speed setting). Your range will increase dramatically on the lower eco levels. Dependent on weight of cyclist, frequent use of PAS, air pressure in tyres, road condition, etc. Continually using the throttle and/or hill climbing will significantly reduce the range of the battery. People come in all shapes and sizes our size guide is only advisory. The best thing to do is test them all out and see which RooDog is the one for you. My husband and I have had our Roodog ebikes, Avatar for him and Chic polka dot for me for one year now and thoroughly enjoy them. Being 67 and 63 years of age they are a real boon to arthritic joints, no matter the terrain or weather we can explore where we holiday. We have always ridden bikes but the power assist is a great help and would not go back to a normal bike now. Scott is always friendly and willing to chat and the customer service is 1st class. Never have we experienced such amazing service. Scott not only says what he will do but follows through, well done Scott. To anyone reading this I can only say do not hesitate, buy from Roodog and experience the best in quality and service. 250W 36V, last generation rear wheel hub brushless motor (with max. speed of 15.5mph which is allowed by UK/EU regulation). 36V 10Ah, lithium polymer battery (hidden in frame). LCD display; Battery indicator, management of 5 speed, LED lights, PAS system, tripometer and speed indicator. 5 Speeds on both models. Aluminium alloy, double wall, inner 19mm. Kenda, 26″ x 1.95 mountain bike style. Suntour XCR32 suspension with lock out option. Front and rear Tektro disc brake. In stock delivery: 3-5 working days. Free to collect. £25 in mainland UK for Mon-Fri delivery. Saturday delivery is available for an extra £25. Your e-bike will require minimum effort to put together on arrival. Your new RooDog e-bike will come 80% pre-assembled. Detailed and easy to follow instructions are provided. Buy with confidence. We quality check test and inspect every e-bike before it leaves. Please call us or email us at: [email protected] for prices for delivery to Scottish highlands, UK islands and Northern Ireland. You can also check this information on our shop page when you enter your post code.